Multi-purpose formulation for the control of mites, insects, and fungus. 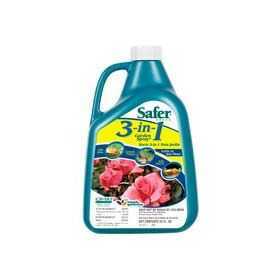 Can be used on roses, flowers, vegetables, trees, fruits, shrubs & houseplants. SaferÂ? Brand 3-In-1 Concentrate can be used to kill insect and mite pests and to prevent and control fungal disease. SaferÂ? Brand 3-In-1 Concentrate contains sulfur and insect killing soap derived from natural fats and plant oils. 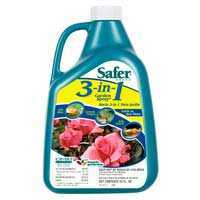 Its formulation is gentle on most plants. SaferÂ? Brand 3-In-1 Concentrate is designed to kill pests and create an environment where damaging fungi cannot live. It can be applied directly to fruits and vegetables up to day before harvest.